Few bike commuters were more pleased than Megan Ryerson when Chestnut Street, as it goes through University City, got a bicycle lane nestled between the curb and parked cars. Parking-protected bike lanes are considered among the safest designs for cyclists because they separate bikes from moving traffic. Still, Ryerson, a University of Pennsylvania professor of city and regional planning, wanted a more scientific way to quantify that feeling of safety. "I know as a cycle commuter with my children on the back, I'm constantly thinking about safety and my safest route," she said. "I don't know how I'm measuring safety besides just how I feel." She decided to create a way to measure that feeling. Since October, Ryerson and her team of students have been using a pair of specialized glasses to determine what happens when cyclists and pedestrians travel city streets. The eyewear, which looks like heavily accessorized shop-class safety glasses, has cameras facing both outward and inward, at the wearers' eyes. 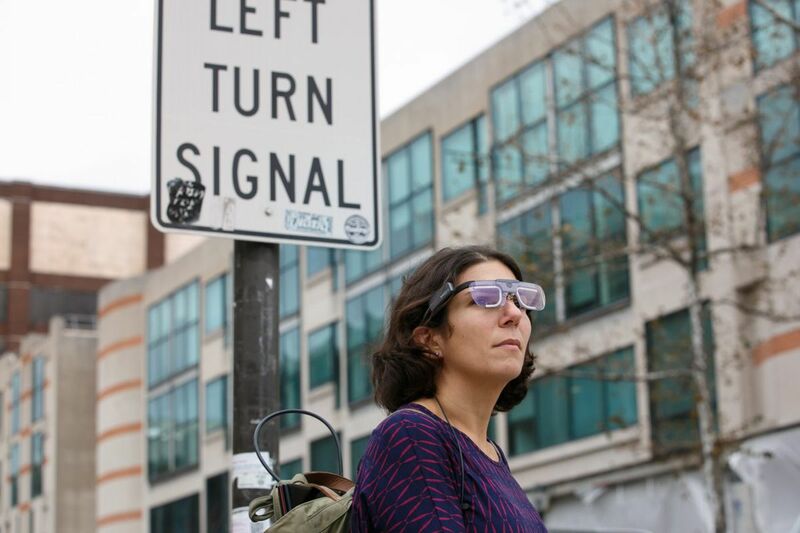 The glasses are not a new technology — they're used to measure drivers' responses in driving simulators — but Ryerson believes she is the first to use the cameras to study pedestrians and cyclists. The glasses capture data on where a person is looking, head movement, pupil dilation, and how long a wearer holds a gaze. The research is only in a pilot stage now, but with enough data Ryerson believes the glasses could be used to improve street design by making it more in tune with the way people see and react to a city environment. "Philadelphia is growing very rapidly," she said. "We have this old legacy infrastructure, and we're not growing without more walkers, cyclists, and transit users." She would need many more test subjects than she has now, but the data she's gathering could also be valuable to autonomous car technology. With enough profiles of pedestrians, the information could be fed into driverless car software to teach it how human beings travel through city streets. Ryerson and her team presented their data Tuesday to an audience that included staff from the city's Office of Transportation and Infrastructure Systems and the Delaware Valley Regional Planning Commission. Both are involved with Philadelphia's safe streets initiative, Vision Zero. The plan for that program includes more protected bike lanes in the city and redesigned sidewalks and intersections. Ryerson's data could help city planners shape those changes. "It was an interesting continuum of work," said Greg Krykewycz, the DVRPC's associate director of transportation. "It's trying to get at the same question: It's how do you feel at this moment." The person who wears the glasses must also carry some heavy equipment, including a laptop computer that records the data. So far, about 10 cyclists and 10 pedestrians have been recorded using the eyewear. It was borrowed from Children's Hospital of Philadelphia, which uses it to study the habits of teenage drivers. Example 2 – Chestnut Street from Carrie Sauer on Vimeo. One test compared a cyclist's responses on Chestnut Street's parking protected lane with that of a cyclist on an unprotected bike lane on Walnut Street. The Walnut Street rider's gaze was focused intently ahead, an indicator of stress. But the goggle cameras also recorded a wider spread of eye and head movement, meaning the rider was looking around for potential hazards. Any time a cyclist turns away from what's ahead, she said, there's a risk of missing a divot in the road, a pedestrian, or a car. The cyclist on the parking protected lane, meanwhile, was less intensely focused directly ahead, but also seemed to be looking around less. That person appeared more relaxed and less concerned with threats. Compared with pedestrians, cyclists tend to look down, due to the hunched position many bikes require. To improve safety, she said, the city may want to consider painting the interiors of bike lanes to make them easier for cyclists to follow. She also noticed that cyclists completely ignored a sign at 33rd and Chestnut Streets that warned that the bike lane was switching from the left side of the street to the right. PBL transition at 33rd Street (example 3) from Carrie Sauer on Vimeo. The problem, she believes, is that the sign is four feet high, which meets Federal Highway Administration guidelines but may be too tall for many cyclists' field of vision. The death of Emily Fredricks, 24, last week on 11th and Spruce Streets punctuates the need for protecting cyclists. She was killed by a trash truck that struck her as she was cycling in a bike lane. Ryerson thinks the city's commitment to making the streets safer will yield results, but she also would like to see changes happen more quickly, particularly on the heavily traveled bike lanes along Pine and Spruce Streets. One of Ryerson's graduate students, Rachel Finfer, said the crash last week was similar to one that killed a friend five years ago in San Francisco. She has seen how debates over bike lanes can pit motorists against cyclists, and hopes the data the Penn team is collecting can inject reason and hard metrics into the conversation. "People get so emotional and they take so much ownership over the streets," she said. "Sometimes you need a data-driven approach to balance that emotional equation." Ryerson's approach does need some refining. For one thing, the glasses are unwieldy, which may affect how users are reacting. She's hoping to get a wireless pair with grant money. Another issue is the difficulty of adjusting variables, such as lighting, lane markings, and signs, on a public street. "Scaling it to different location types and a noncontrolled group of users is an interesting challenge," said the DVRPC's Krykewycz. The University of Pennsylvania has 23 acres around the Pennovation Center where Ryerson envisions creating an outdoor street laboratory. On that Grays Ferry campus, researchers could observe the reactions of hundreds of people to various kinds of intersections and street configurations. During the presentation Tuesday, Jeannette Brugger, the city's bicycle/pedestrian coordinator, noted the Penn team's data confirmed some hunches she had about the intersection on 33rd Street. Ryerson wants to see these kinds of interactions continue, with her team answering the city's questions as it works to improve street safety. "I would like the city to say, 'Here are the five things we would really like to study,' " she said. "This is what my team is really set up to do."